The widow of an elderly black man shot to death by a white police officer last year has reached a settlement with the town of Homer, La., closing a lawsuit brought by the Southern Poverty Law Center on her behalf. The town's board of selectmen approved the agreement in August. As part of the settlement, the SPLC agreed not to disclose the amount of the monetary damages, and the town did not admit liability. The SPLC filed the civil suit in state court this past February. It sought damages for the wrongful death of Bernard Monroe Sr. and for the emotional distress suffered by his widow. "The settlement will allow the town of Homer and Bernard Monroe's family to move forward from a terrible tragedy," said SPLC Chief Trial Counsel Morris Dees. "We're delighted the town's leaders have done the right thing by settling this case rather than drag it into court." Homer City Attorney Jim Colvin said the agreement will help heal the community. 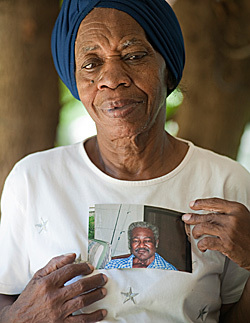 Marie Monroe holds a photo of her husband Bernard. The couple had five children, 18 grandchildren and 15 great-grandchildren. "The town needs an opportunity to recover from this unfortunate event," Colvin said. "This settlement is a key step in that healing process." The lawsuit alleged that two officers, Tim Cox and Joseph Henry, both white, created a volatile situation when they came onto Monroe's property during a family gathering on Feb. 20, 2009. Cox and Henry chased Monroe's son into the family home, and Henry shot him in the back with a Taser gun. As Monroe was climbing his porch stairs to check on his elderly wife during the commotion, Cox shot the 73-year-old man several times through the screen door from inside the house, the lawsuit says. Monroe, who had lost his voice to cancer, was unable to speak during the incident. The officers said they thought Monroe had a gun; several witnesses said he did not. Both officers involved in the shooting have since left the police department in Homer, a town of 3,800 people, located about 50 miles northeast of Shreveport. Georgia Norton, sister of Monroe's widow, Louise Marie Monroe, said the family was grateful to the SPLC for its help. "Everyone we met at the Center was kind and considerate," she said, adding that the attorneys were "real people who cared about our family." SPLC lawsuits are supported by its members, and the organization accepts no part of the damages awarded to its clients.